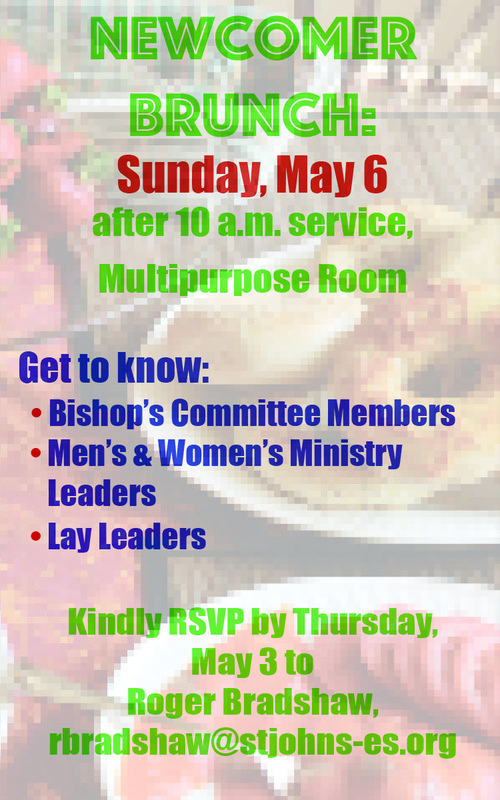 St. John’s is hosting a brunch for newcomers to St. John’s on Sunday, May 6. If you’ve begun attending our church within the recent past, please join us! 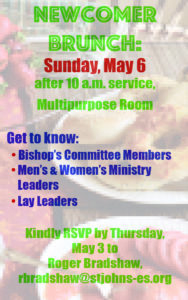 The brunch begins after the 10 a.m. service in the Multipurpose Room, and will last about an hour. Members of the Bishop’s Committee will be present to share about St. John’s along with leaders of other St. John’s ministries. This event will allow you to get to know many of our lay leaders and will give you a broad perspective of the activities and upcoming events of St. John’s and how you can become involved. We look forward to seeing you there and learning more about you, too. So that staff may make arrangements for seating and food, your RSVP by Thursday, May 3, would be helpful. Thank you!